If you go online to search for some cleaning tips, chances are that you will get something very specific, such as how to clean coffee stains or something to that effect. However, if you are looking for very simple and basic instructions on how to clean your home quickly and effectively, you might be surprised at the lack of credible and useful resources. Fortunately, some cleaning experts, such as people at HappyCleans are willing to share some tips from their careers and experience. Here are some useful tips on how to clean your home, especially some of the hotspots. For most people, the microwave is a very convenient and simple appliance which they use on a day to day basis. However, when it comes to actually cleaning it, most people are not so diligent. So, when the time comes to clean the device, people typically look for the easiest and simplest way to do it. It is likely that you’ve heard that putting a big bowl of vinegar into the microwave and turn it on for a while. However, if you have actually done this, you know that the smell can be overpowering and not at all pleasant. There is a better way, though. Take a sponge, soak it in water, and put it in the microwave. 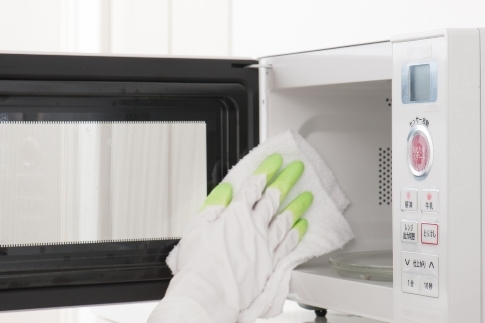 Use a spray bottle with a mixture of water and lemon to spray the dirty walls of your microwave. When you turn on the microwave, the water evaporating from the sponge will make it easier to clean food leftovers, while the lemon smell is a lot better option than vinegar. Washing your windows is typically very annoying and takes forever. What’s more, even one touch with your bare hand can undo all of your hard work. However, cleaning experts have a fairly simple and effective secret weapon – a squeegee, or a similar window cleaning device. Professional window cleaners have been using these for years to great effect, but not a lot of people are aware of just how effective and simple these can be. Washing your windows, no matter how big they are can be done in a fraction of a time you would need if you did it with a cloth. However, the usefulness of a squeegee doesn’t end there, you can use it to wash your mirrors in just seconds, as well as your shower doors. We sleep in our beds every night, which means that they don’t really have much time to be freshened up and after a while, they might become a bit musty and stale. However, there is a way to help your mattress feel fresher and be healthier for you, and it is not complicated, not expensive, and doesn’t take too much time or skill – using some baking soda. Spray some baking soda on your mattress and leave it there for an hour or so. The baking soda will absorb the smells and get rid of the dust mites which live in your mattress. When you are ready, vacuum the baking soda, and you will have your mattress fresh and renewed. If you are so inclined, you can use some essential oils to enhance the smell of your mattress. Making shakes and similar things is great and healthy, but having to wash the big and cumbersome blender afterward can get you to reconsider. However, there is a really simple and effective way to wash your blender. Simply will it up with hot water, add some dish soap and turn it on. The blender will mix in the soap with the water and essentially clean itself. Handy tips like these can make cleaning your home much simpler and easier, so try them and see how much time and effort you can save.